From codices to calendars, storytelling has been part of Indigenous life since time immemorial. The practice we call “journalism” has deep roots in Indigenous communities. From calendars to quipus, codices to songs, record keeping and storytelling have been part of Indigenous life since time immemorial. One of the most influential and enduring forms of documentation has been the ledger drawing: a genre created in the mid-1800s by Plains artists using grease pencils and ledger books — people like Silver Horn, Mad Bull and Zotom. Zotom was one of more than two dozen Kiowa prisoners of war imprisoned at Fort Marion in St. Augustine, Florida, in the 1870s at the end of the Red River War. During that conflict, tribes fought to stop the United States’ violent, and illegal, expansion into the Great Plains. Zotom and other prisoners documented their journey to prison and their experiences in ledger drawings — a stunning piece of visual reporting that testifies to the innovative styles of storytelling and documentation of 19th century Indigenous communities. This distinctive style of reporting, which has been criminally undervalued by journalism historians, stems not from a tradition rooted in Western democracy, but rather from the desire to record events in ways that reflect a community’s values, interests and priorities. With this tradition in mind, we embraced an unusual medium this issue: the graphic novel. 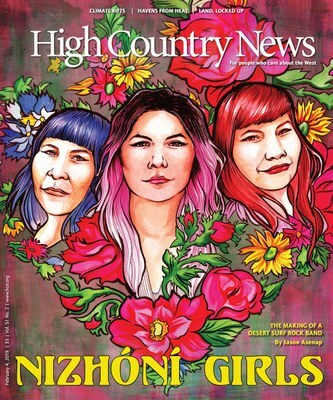 The story of the Nizhóní Girls is a contemporary story, one common to Indian Country though overlooked by non-Indigenous reporters. This is the story’s strength: It is the record of a moment and reflects the values and priorities of one group of Native artists at one point in our collective history. Liz McKenzie in her garage before the Nizhóní Girls' September show. Rebecca Jones, Nizhóní Girls' lead guitar player. Lisa Lorenzo, the band's drummer, during their opening set for artist Shonen Knife. Liz McKenzie during the band's sound check. Artist Shaun Beyale sketches concept drawings during the Nizhóní Girls' show. Liz McKenzie performs onstage at Launchpad in Albuquerque, New Mexico. The Nizhóní Girls, from left, bassist Liz Mackenzie, guitarist Becki Jones and drummer Lisa Lorenzo, in Glass Beach, near Albuquerque, New Mexico, last month. And we decided to tackle this story with the help of an all-Indigenous team. Jason Asenap (Comanche), a regular contributor to HCN (and a personal friend), is also an accomplished screenwriter. While we can’t afford to produce his screenplays (yet), we can find creative and dramatic ways to bring his visions to life — in this case, the graphic novel. Shaun Beyale (Navajo), an accomplished artist — and a former classmate of mine at the Institute of American Indian Arts — helped bring this story to life. Beyale’s work typically explores the fantastical elements common to the comic book world. His project Ayla: The Monster Slayer is set in a post-apocalyptic Southwest where humankind is on the brink of extinction. Ayla, a Navajo superhero, must protect her people and restore balance to a land ruled by an evil force. Beyale’s ability to visualize the Nizhóní Girls’ story enabled him to serve, essentially, as “photographer” for this issue’s feature. From codices to calendars, from ledger drawings to graphic novels, the visual journalism we present in this issue is deeply rooted in Indigenous experiences, traditions, themes and values that explore ideas of friendship, family — and, of course, a little rock ’n’ roll. We hope this story speaks to you as well. 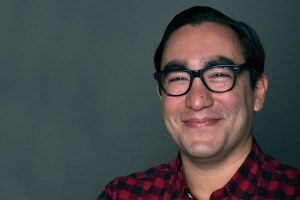 Tristan Ahtone is associate editor at High Country News, overseeing the tribal affairs desk.